The calendar below shows our upcoming cook schedule. The calendar includes the following information. What menu we will be cooking each week; Menus are identified by “Week 1 Menu” to “Week 7 Menu”. To see what is included in each of those seven menus, open this print ready PDF. When each menu will be available. When the orders are due for each menu. 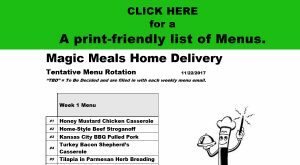 If that particular menu is available for Lawrence delivery; we delivery to Lawrence roughly every-other week. If there is no menu available during a given week, that indicates we are not cooking that week. Deliveries of meals normally are made the Monday following the order’s due date. We will contact you a few days ahead of delivery to schedule a delivery time that works for you. Please remember that this schedule is subject to change since Magic Meals is a small family business. Be sure to signup for the weekly email to get notifications of any changes. If you would like to see Past Menus, they are included here.